Book cover art by Romas. The fantasy debut of historian David B. Coe is a highly readable adventure with a freshness and appeal that too many modern fantasies lack. I found the tale enjoyable, unpretentious, avoiding obvious Tolkienisms, with characterization superior to most of what is being sold and touted these days as the best of the best. Yet it has what you could term some routine first-novel flaws. Its pace is too languid, its narrative not always well focused. And it's loaded with predictable "surprises" that flatten suspense when it should be peaking. Coe's story roots itself in that perennial Campbellian trope: a youth of humble origin who is destined for greatness. The peninsula of Tobyn-Ser is governed by the Children of Amarid, a benevolent order of mages. They generally keep a low profile but are known by their signature green cloaks, crystal-tipped staffs, and by the hawks or owls that are their familiars. Jaryd is the son of a blacksmith who discovers one night to his shock and chagrin that he has prescient dreams. He soon learns that his uncle Baden has been a Child of Amarid for years and that both his grandmother and great-grandmother were powerful, famous mages. 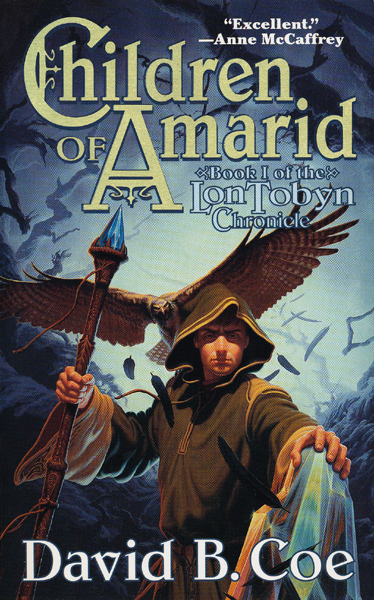 So Jaryd finds himself journeying to the city of Amarid with Baden to be initiated into the order. But there is strife in Tobyn-Ser. A group of renegade mages is, for reasons unknown, committing wanton murder, havoc, and destruction. The C of A are no longer trusted by many people, and the order is threatened. Baden believes that the violence is being perpetrated by the restless spirit of Theron, a long-dead, cursed mage. Baden suggests that a delegation from the order should visit Theron's Grove, from which no human has emerged alive in hundreds of years. Not everyone is enthusiastic about this. Baden's insistence that young Jaryd, who is still uninitiated, accompany the delegation meets with controversy as well. Jaryd is having his strange dreams again, this time of a mysterious hooded mage with an ominous black bird. Baden is convinced Jaryd is destined to become one of the most powerful mages ever. Clearly, the boy possesses a link to current events no one else does. The novel is pretty talky, but thankfully Coe has a good ear for dialogue and his characters' conversations are unstilted and often witty, both propelling the story and providing appealing insights into character. Jaryd is a likable, convincing 18-year-old. He has a somewhat rebellious streak, dismayed by many of the staid and ineffectual traditions of the Children. He's hung up on girls to boot. Coe treats his other characters with as much human warmth. He also handles scenes of mayhem with appropriate visceral horror. If some of his plot developments don't smack of blazing originality, at least they earn points for cleverness. The inclusion of SFnal elements is interesting. But throughout, the story's pace rarely shifts past second gear. The narrative and its characters, brought to life by Coe's elegant and pleasing-to-read prose, will carry die-hard fans of epic fantasy through the tale's lulls. Casual readers might tap their feet in impatience. Sometimes Coe disrupts his tale's momentum through some narrative backpedalling. An entire scene will be rehashed from the beginning simply to offer us another character's viewpoint. And the suspense in the second half is slightly undercut as Coe gets predictable in many of his double-crosses and reveals (though there is one doozy of a surprise near the end). The plot doesn't fail logically — in fact, I was most impressed by how Coe avoided the trap so many fantasists fall into, of overplotting and cluttering their novels so heavily that all is confusion. But most of the failings in Children of Amarid are the kind of thing that one would expect to find in a debut (such as two climaxes). You can cut him plenty of slack. After all, when you consider how so many epic fantasies do little more than regurgitate clichés, Coe has achieved quite a lot his first time out. Had the book been about 400-450 pages instead of nearly 600, I'd have admired it that much more. Children of Amarid shows Coe at the onset of his career still developing his storytelling chops and obviously enjoying himself doing it. There are definite indications this trilogy will get much more intriguing as it progresses, so those of you who live for thick epic fantasies bearing the Tor logo shouldn't pass it by.